Royalty free photos ethics. You can use them for business and personal purposes. 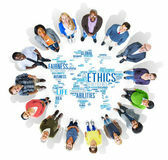 Images ethics is available 24/7. Buy unlimited royalty free licenses. Standard image license ethics is suitable for your advertisement, on website, on packages, leaflets, printed ads etc. 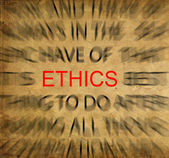 Extended royalty free license ethics is suitable for you products. Are you not sure what type of license do you need? See the simple decision table standard or extended lincense of an image. Imagine Ethics Dictionary definition of the word "ethics", in macro. 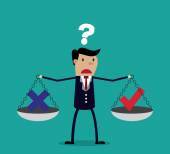 vector Cartoon businessman balancing cross and tick symbol Cartoon businessman balancing cross and tick symbol on two weighing trays on both arms. Creative vector illustration for ethical dilemma concept isolated on green background. 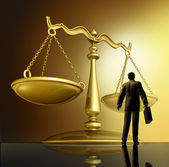 Imagine Lawyer And The Law Lawyer and the law with a justice scale made of brass gold metal on a glowing background as a symbol of the legal advice, system in government and society in enforcing rights and regulations. vector Abstract Businessman has a Moral Dilemma Abstract Businessman has a Moral Dilemma. Great illustration of Retro styled Businessman caught up in a Catch-22 battle of wills with both a devil and an angel helping him to decide. Imagine Ethics Green Road Sign Over Clouds Ethics road sign with dramatic blue sky and clouds. Imagine Successful business people handshaking after good deal. Business partnership meeting concept. Image businessman handshake. vector Corporate Guy has a Moral Dilemma. 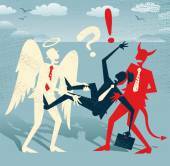 Great illustration of Retro styled Corporate Guy caught up in a Catch-22 battle of wills with both a devil and an angel helping him to decide. 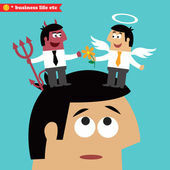 vector Businessman decides between Good and Evil. 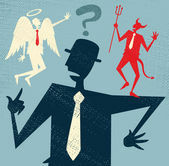 Great illustration of Retro styled Abstract Businessman caught up in a Catch-22 battle of wills with both a devil and an angel helping him to decide. Imagine Woman Pushing Ethics Button on Interactive Touch Screen Attractive Blonde Woman Pushing Ethics Button on an Interactive Touch Screen. vector Abstract Businessman in Good versus Evil Tug of War. Great illustration of Retro styled Abstract Businessman who is caught in a titanic struggle between a Devil and an Angel fighting the battle of Good and Evil. Imagine Integrity on Wooden Piece Arranged by Businessman Close up Businessman Arranging Small Wooden Pieces with Integrity Letters on Black Background. Imagine Supreme Court building. 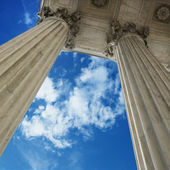 Low angle view looking up at blue sky with clouds and columns of Supreme Court building in Washington DC. Imagine Gavel and Black Leather Briefcase Gavel and Black Briefcase on Gradated Background with Selective Focus - Business Law Concept. Imagine Right Weighs In Against Wrong Bright, gold "RIGHT" weighs one end of a gray balance beam down while a gray "WRONG" sits high in the air on the other end. Focus is on "RIGHT". Isolated on white.